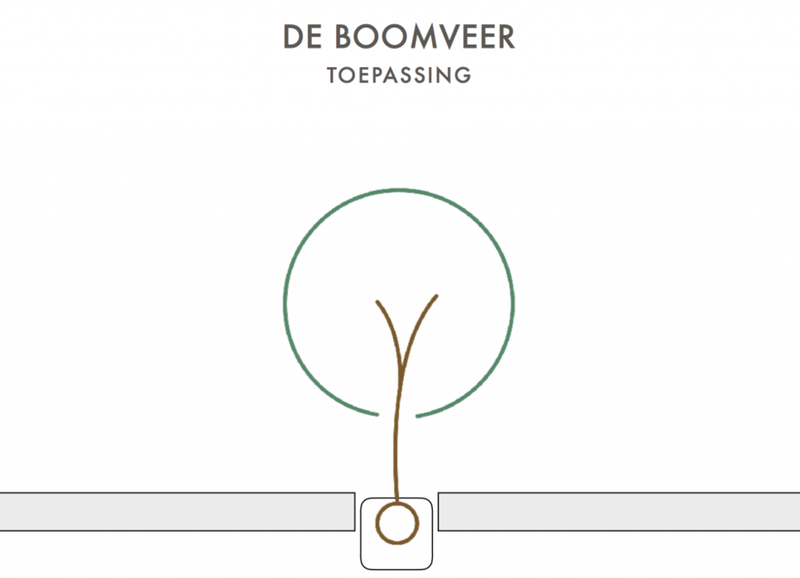 The special construction of the Boomveer and the function of the interface as a connecting element between building and tree is the Boomveer is ideally suited for application on existing buildings. Although the existing buildings in urban areas are not designed to carry heavy loads it is possible to develop gardens with trees on the roof. The limited weight of the Boomveer makes it possible to realize green eaves, by placing the trees on the roof edge above the outer walls or on other bearing parts. In the city, this gives us the possibility to develop a roof garden that gives shadow that has a cooling effect on buildings and as an extra benefit offers a pleasant place to be in the summer. By creating green eaves on adjacent buildings we develop roof landscapes. The connecting green eaves give birds, bats and insects the opportunity to migrate over larger areas in the city. K +, Na +, H +, NH4 + and NO2- can, combined with the extracted moisture, be used as fertilization of the green eaves. A ' living – climate – machine ' is a dynamic living system for climate control. ' Living – climate – machines, "which operate on the building, (sub-)area or district level, deliver more opportunities in the built environment to restore cycles in a constructive and sustainable way. With a ' living – climate – machine ' you have control on all streams (fluxes) that transcend the different scale levels. This means that the microclimate components both inside and outside the building in conjunction can be controlled. The system is however not only limited to the building. The system has also influence on the scale of landscape and urban planning. Thanks to the consistency between the different scales, which is unique to this system, you make the conversion of a destructive to a constructive system. No flux is used destructively, or is lost, for his (in-)direct environment. The system becomes a closed loop. Because you control all micro-climate-fluxes (e.g. heat, energy, light, air and water) with a 'living – climate – machine ' you have more control over the climate than with the regular climate management systems, such as f.e. air conditioning. The micro-climate-fluxes play a pivotal role in the functioning of the system. There are no other machines in which all these components are united. In nature this is always the case. This natural and dynamic machine develops and strengthens itself and is therefore much more durable than the current techniques which are degenerate over time. The ambition is to let the ' living ' – climate – machine function as a useful (autark) green system, where, of course, at all stages of life, natural life-cycle processes take place. Therefore we promote ' building with nature '! By the development of the Boomveer, we are able to develop multifunctional roof landscapes, that on the scale of a city, neighbourhood or district have a tangible contribution to light, air and water management, both inside and outside buildings. Greening of buildings is for us no longer the regular application of a green skin along a facade and/or roof, how beautiful and attractive that may be. We want more! The meaning and functioning of the existing (1st) nature in the city will be enhanced by the addition of roof green (the 2nd nature) and can be used for climate control. We introduce the 2nd skin to enable climate regulation (double skin). This may be because nature gives us the possibility to use physical principles that can increase our quality of living by influencing on the energy-, light-, water-, heat- and air management, f.e. CO2 capture. Nature is here in service of both the users of a building, as its surroundings.